Edit: You can now withdraw your BCH or sell it for Bitcoin. Log in to Luno, navigate to Wallets > Send BCH. The Bitcoin Cash (BCH*) project intends to hard fork from Bitcoin on 1 August 2017. At this stage, it appears the fork is only supported by a small minority of platforms, users and miners. It’s unknown whether this fork will survive or what value it might attain. Bitcoin Cash is a fork of Bitcoin and at this time we don’t plan to support the buying, selling or depositing of Bitcoin Cash on the Luno platform. However, if Bitcoin Cash survives the fork and has non-trivial value, we will provide a mechanism for our customers to withdraw their Bitcoin Cash (see the FAQ, further down). This functionality will take time to implement and will only be available some days after the fork occurs. If you intend to actively trade Bitcoin Cash for crypto or local currencies in the days following the fork, we recommend that you withdraw your BTC to a Bitcoin Cash-compatible platform, before the fork occurs. We can’t make any recommendations for which third-party platforms to use. If you don’t intend to actively trade Bitcoin Cash, you may leave your funds at Luno and choose what to do with your BCH funds at a later date, if you think it has reasonable value or utility, and Luno considers it to have non-trivial value. Our team is prepared for this technical event. Our priority remains to safeguard our customer’s funds under whatever scenario arises, now and in future. Is it safe to have Bitcoin (BTC) on Luno during the fork? Yes, your funds are safe with Luno. During this upcoming fork, nothing will affect your Bitcoin balance: you don’t need to sell it — unless you want to, because of potential for volatility — and you don’t need to withdraw it — unless you want to actively trade the new currency, Bitcoin Cash. If there is a split, will I have an equal amount of Bitcoin and Bitcoin Cash? After the fork, you will have an equal amount of Bitcoin (BTC) and Bitcoin Cash (BCH). If you had 1 BTC before the fork, you will have 1 BTC and 1 BCH after the fork. You will be able to use your Bitcoin like normal. You will still be able to use it as a store of wealth, sell it for local currency — or other cryptocurrencies— based on the relevant exchange rate(s), send it to other Bitcoin wallets, and use it as a means of payment all around the world. Anything you do to your Bitcoin (BTC) after the fork (like selling, trading or sending it), will not affect your Bitcoin Cash (BCH), since they are independent currencies. Bitcoin Cash may have some value, and if so, you can withdraw it to a Bitcoin Cash-compatible platform. It will not be compatible with any existing “regular” Bitcoin wallets, platforms or software. Bitcoin Cash may also have absolutely no value or utility and ultimately fail. Only time will tell. What does Luno consider “non-trivial value”? If Bitcoin Cash doesn’t attain non-trivial value, we won’t provide withdrawal functionality. What is the reason for the fork? For context, we previously wrote about the Bitcoin Unlimited near-fork (in March 2017): On the Bitcoin hard fork. We wrote another article that gave more background on the scaling debate, SegWit, BIP91, BIP 148 and Bitcoin Cash: The scaling debate, Bitcoin forks and potential disruptions. 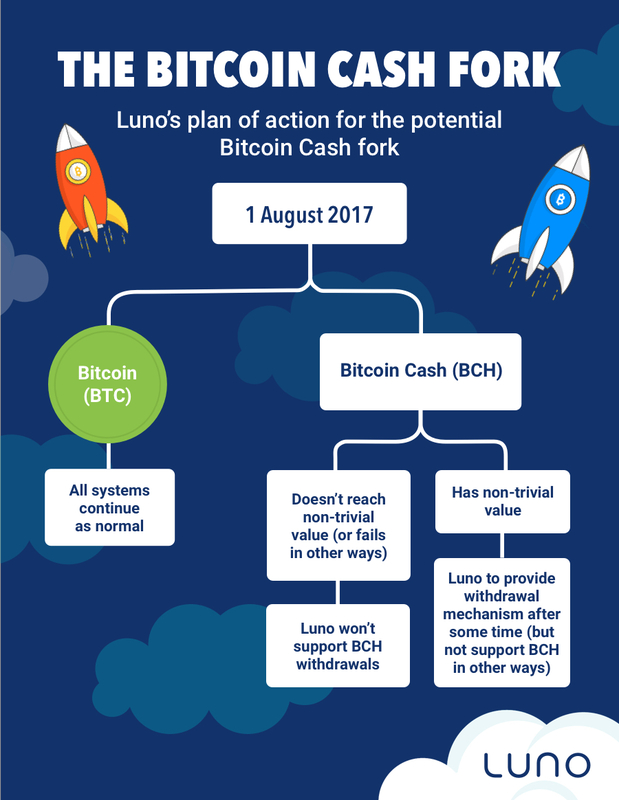 Has Luno changed its position on Bitcoin Cash? We define “supporting” a cryptocurrency as giving our customers the ability to send, receive, store and in supported countries buy and sell it with local currency. By that definition, we still don’t intend to support Bitcoin Cash. 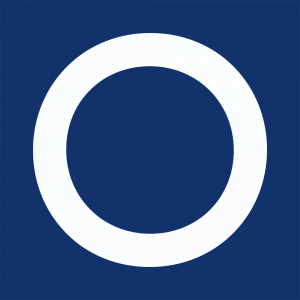 That said, due to the general confusion in the market about what people should do with their Bitcoin, requests by the community, and the chance that Bitcoin Cash will have some non-trivial value in future, we decided to make contingency plans for our customers to allow for Bitcoin Cash withdrawals. If Luno considers the value of Bitcoin Cash to be negligible, what happens to the BCH coins? Nothing. We don’t plan on selling, accessing or otherwise using Bitcoin Cash derived from our customers’ Bitcoin. * We decided to move away from 'BCC' and instead use the code 'BCH' to indicate Bitcoin Cash. Some platforms still use the code 'BCC', but that code is already associated with another altcoin. This article has been updated to show 'BCH', but 'BCC' might appear in some of our other, older content.